Today, Monday June 11, 2018, NCH Director Megan Hustings and Public Education Coordinator Steve Thomas will participate in nonviolent direct action with the Poor People’s Campaign. We plan to risk arrest in solidarity with the thousands of our homeless neighbors who are arrested and fined every day for carrying out life-sustaining activities in public spaces. We can no longer accept the false narratives that allow for systemic racism to cause such deep inequality and economic injustice in our communities. Co-chairs Rev. Dr. William J. Barber and the Rev. Dr. Liz Theoharis, of the Poor People’s Campaign tell us that to change the narrative, we must change the narrator. NCH has, since its inception, stood to raise the voices of, and take our direction from, the community of people who experience homelessness – those who are most affected by economic injustice. We envision a world where everyone has a safe, decent, accessible and affordable home. NCH affirms that we can and must end and prevent homelessness. We believe in the dignity of all people; and in housing, healthy food, quality health care, education and livable incomes as basic human rights. We believe that it is morally, ethically, and legally wrong to discriminate against and criminalize people struggling to meet their basic needs. We affirm that public policy makers and elected officials at all levels must be held accountable to end the systemic and structural causes of homelessness, and that structural racism and discrimination are root causes of homelessness and violates human dignity. This is the 5th week of 40 Days of nonviolent resistance through the Poor People’s Campaign: A National Call for a Moral Revival, focusing on the theme that Everybody’s Got the Right To Live: Education, Living Wages, Jobs, Income, Housing. We call on you, our supporters and partners, to stand with us in challenging the evils of systemic racism, poverty, the war economy, ecological devastation and the nation’s distorted morality. 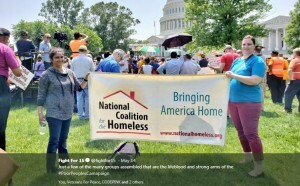 “Over the past two years, the Poor People’s Campaign: A National Call for Moral Revival has reached out to communities in more than 30 states across this nation. We have met with tens of thousands of people, witnessing the strength of their moral courage in trying times. We have gathered testimonies from hundreds of poor people and we have chronicled their demands for a better society. The following moral agenda is drawn from this deep engagement and commitment to these struggles of the poor and dispossessed. It is also grounded in an empirical assessment of how we have come to this point today. The Souls of Poor Folk: Auditing America report reveals how the evils of systemic racism, poverty, ecological devastation, and the war economy and militarism are persistent, pervasive, and perpetuated by a distorted moral narrative that must be challenged. Please visit https://www.poorpeoplescampaign.org to read the full The Souls of Poor Folk report: Auditing America 50 Years After the Poor People’s Campaign Challenged Racism, Poverty, the War Economy/Militarism and Our National Morality, as well as the campaign’s principles, and demands.